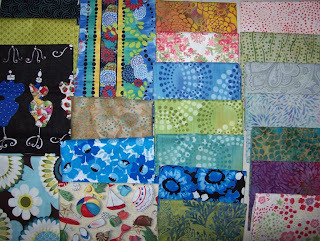 As I look at my stash of fabric from Quilt Festival, I notice I bought a lot of greens and blues. I guess that's not so unusual, as they're two of my favorite color families. But in this mix and in some of the previous posts, I also added an orange and a purple, which is a little out of my comfort zone. And it's all about building a stash of fabric that covers the entire color wheel, so I can design a quilt without having to head out to the store for one little thing. As for the vendors that were able to supply me with such great fabrics: the left two rows and bottom 5 in third row are from Material Mart. The top two in third row and the entire far right row came from Silver Thimble. The one with the sailboats and beach balls is for my Mom and her friend Martha to make into projects for their Florida craft shows. I got them a half-yard of that--I want them to be able to have some flexibility in what they create with it.